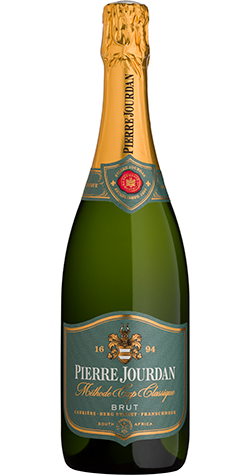 Pierre Jourdan Cuvée is crisp, complex and rewarding on the palate. The color a rich copper, typical for a "cuvée", a blend. The "lime" character of the Chardonnay dominates but are well supported by the complexity of Pinot Noir. This wine was produced in the traditional French method of bottle fermentation, known in South Africa as Méthod Cap Classique. Expect delicate yeasty aromas on the nose, complemented by fresh citrus flavours and a crisp acidity. In typical French tradition Chardonnay allows for freshness, while Pinot Noir contributes to the body and structure of the wine. From Sonya Hicks of College Park, Georgia on 11/21/2018 . I ordered while in South Africa. I have placed additional orders through Cape Ardor. It's GREAT!!! From Anonymous of Narragansett , Rhode Island on 6/20/2014 . From Anonymous of New York, New York on 3/27/2013 . This is an excellent Brut! From Jennifer Billington of Milton, Washington on 9/3/2011 . If you ever can go to there winery and have dinner in Franschhoek, its amazing! Also there sparkling wine is great good flavor and sparkling. Worth the buy.